The Open Now! extension for Visual Studio adds the ability to quickly filter and open any files in your solution. Open Now! allows you to quickly search for files by name and open them in Visual Studio. Open files in Visual Studio or view them in Windows Explorer. 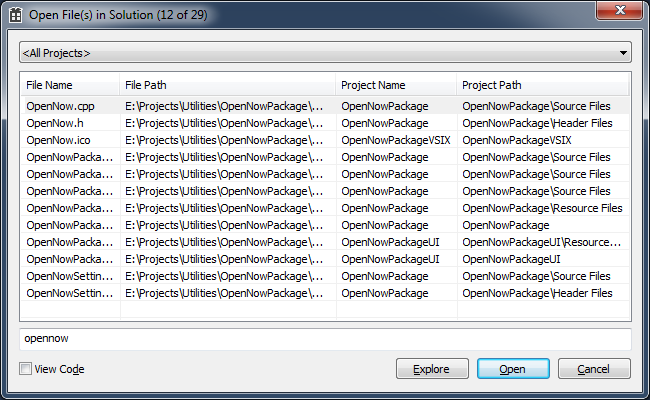 Open files from an optional user selectable directory. Force open files in code view (instead of designer view which some file types default to). Filter and sort by file name, file path, project name and project path. Open complementary file for cycling between header/source, and other related files (this command is hidden by default). The ampersand (&) specifies that the search string should be combined with a logical "and". (Note, this is the default implicit behavior - you probably wont even need to type an ampersand). The vertical bar (|) specifies that the search string should be combined with a logical "or". The hyphon (-) and apostrophe (!) specify that the search string should be negated. The backward slash (\) or forward slash (/) specify that the whole file or project path should be searched, not just the file or project name. The colon (:) specifies that the project or project path should be searched and not the file name or file path. The double quote (") can be used to surround the above special characters (or spaces) to effectively "escape" them. The asterisk (*) can be used as a multi character wildcard. The question mark (?) can be used as a single character wildcard. substring .h Find all files containing substring in all .h files. substring |.cpp |.h Find all files containing substring in all .cpp and .h files. substring -.h Find all files containing substring in all files except .h files. substring -.cpp -.h Find all files containing substring in all files except .cpp and .h files. substring \\include\ Find all files containing substring in any folder called include. substring :\"header files" Find all files containing substring in any filter containing header files. :substring Find all files in any project containing substring. substring *.h Find all files containing substring in all files ending in .h.